Well-child checks at Virginia Mason Federal Way involve some joyful sounds and happy faces. The pediatricians give out free, new books for children between six months and five years at every well-child check. The goal is to promote reading and literacy development through a program called Reach Out and Read. 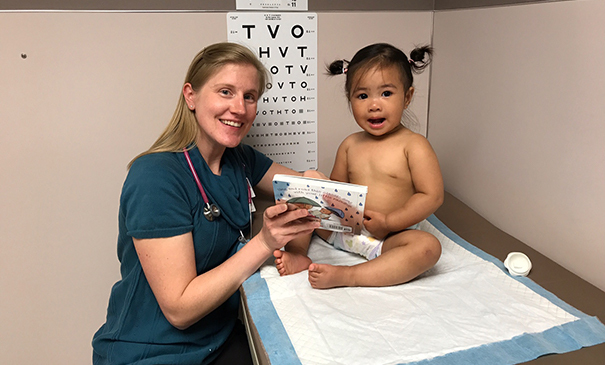 “The look of wonder and excitement on a child’s face when enjoying a new book is rewarding enough but to also know that each book is building a foundation towards life-long literacy skills is priceless,” says Lauren Athay, MD. She is one of the pediatricians at Federal Way and leads the Reach Out and Read program there. Virginia Mason donors supported the launch of the program beginning in July 2017. Now Dr. Athay and the six other pediatricians are extremely proud to be close to giving out the 1,000th book. The doctors receive training in how to give advice and model reading for infants and children. Often, parents are surprised to learn that they can read to their babies early on and that a child can learn more when their parents interact with the child while looking at a book. Parents are 2.5 times more likely to read to their children. Children’s pre-school language development is improved by three to six months. Virginia Mason hopes to bring the program to other locations. Please consider donating to Virginia Mason's programs.